We're about ready to start the contest, and most of you have gotten the magazine with the insert explaining. If you're on the fence about a subscription, act quickly so you can participate too! Here's how it works: Each time a new subscription comes in with "(your name) sent me" in the comments section of the shopping cart, we'll add an issue onto the end of your subscription, up to a full year of 6. AND each time that happens, we'll throw your name into the hat for prizes that we've begun collecting for a drawing at the end of the month. 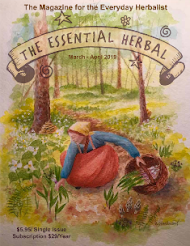 The person with the most referrals automatically wins an herbal treasure trove worth more than $100 in addition to the free issues added onto their subscription and chances to win other prizes. http://www.essentialherbal.com/documents/sample.pdf in case you would like to use that. New subscribers who come on board during July will be eligible to participate too! On the 15th (or thereabouts) I will post a blog of the prizes that we have lined up, and again at the time of the drawing. I was just standing out on the deck listening to the evening, and realized that it would be possible to determine the time by the sounds outside. By the time I rise in the morning, the roosters are kicking up a fuss down the hill at my sister's. As the morning goes on, the guinea fowl are just learning to vocalize and they are practicing. The next sounds will be farm equipment or milk trucks out on the road, while the songbirds flit about calling to each other. Around 11, the chickens calm down. Sometime between 1 and 2 in the afternoon, I will hear the mail delivery jeep. A little bit later, people start to return home from work, and I'll hear their cars on the road. The folks across the road tinker on some antique farm equipment, with lots of hammering and ruckus. It's a good racket, though. Sometimes they mow instead. The neighbors on one side work on their yard, while on the other side the dog welcomes hia people home. As the sun goes down, the birds whoosh and swoosh through the branches, occasionally letting out a squawk, getting settled for the night. The bullfrogs down at the pond set up their chorus for the evening. The peafowl a couple of farms over start to call to each other. I honestly have no clue where they live, but can hear them very clearly. Soon there will be the sound of the train whistle in the next town over every hour or so. Then around 11:30, the cat bird outside my bedroom window will set up shop and sing me to sleep. All of these sounds are pleasantly in the background and I barely notice them unless I listen for them. Even in what I think of as silence, there is a rhythm of people and animals living around me, and it is comforting. 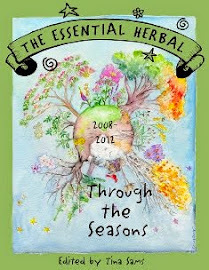 Just getting around to posting the table of contents from the newest issue of The Essential Herbal. You can download a sample issue of the magazine by clicking on the link for that on the sidebar, but this current issue is just arriving in homes of subscribers now. Doin’s here on the hill. Try your hand at lotion and crème with these easy to follow instructions and recipes. Ever wonder when the best time is to plant or mow? Check it out here! Sue-Ryn put together demos and classes for her faire shop, and shares them with us. Did you know there are herbs that grow in the Arctic? Nearly everyone has it growing nearby. Learn what to do with it. Dental Care through the centuries. Try your hand at some fun lavender projects. Some herbs to bring the roar out of the lion! Cory is getting close to delivery, and shares her Birth Kit and Maternity Soup Stock. Cool, crisp beverages for those hot, steamy summer days and nights. Ades, Ales, and Switchels! A mélange of wonderful summertime concoctions for the table! Complete instructions and recipes for the candies we were making all last year. 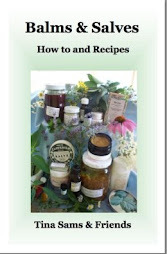 Make a sumptuous salve for all those bumps and bruises, aches and pains. 10 of Susan’s great summertime treats from the garden. Mmmm... What could be more delicious? You won’t run out of ways to use up those beauties! Decidedly different way to delight the whole family. Yesterday Maryanne and I were planning to finally get back to making cheese. We took a class at The Rosemary House a few years ago, but then family situations came up that made us put away our cultures and cheesecloth. So a couple of friends came over to help. One of them, Mary, said, "You have some interesting project going every day!" I never really thought about it, but it does seem that most days there is something fun to do. Today it was the sour cherries. Last year I stumbled across some sour cherries at the Lancaster Central Market, and having recently read about the possible effects of sour cherry juice on arthritis and achy joints, I decided to make a tincture. So began my journey into the joys of fruit infused vodka (or alcohol of your choice). It was just going to be a tincture - pure and simple - but then things took a turn. I purchased 2 pounds of the cherries and pitted them before putting them into a large jar and covering them with vodka. 6 months later, it was about ready but my sister suggested adding a vanilla bean for another month or so. There was only about a quart when it was all said and done, and we've sipped it on occasion, wishing there was more. This year I got 5 pounds of cherries, and may go back. In the meantime, I've really been enjoying this form of "tincturing" . The other day someone on a forum suggested lavender liqueur, so I infused 2 heaping tablespoons of fresh Hidcote blossoms in a pint of vodka overnight. Into that pint, I also added a couple of tablespoons of sugar. The next afternoon, I tasted it, and the lavender flavor was distinct, but not overpowering. Time to strain it out. I zested a lemon into the jar and gave the lemon a healthy squeeze, and returned the lavender infused vodka to the jar. The hope is that it will taste something like lavender lemonade when it is finished in a couple of months. By the way, these infusions REALLY get mellow the longer you can manage to let them sit. There are several pints of strawberry infused vodka out there, and one of blueberry. I'm going to be going into the woods for wild black raspberries in the next couple of days :-). You don't need to use vodka, necessarily. Rum would be great, and some people prefer whiskey. I have a couple of things soaking in brandy, too. 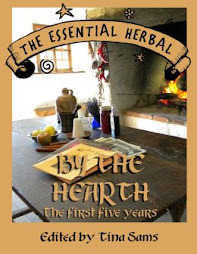 Last year I spent a lot of time making herbal tinctures. I suppose this is the year of the fruit infused vodka! Yesterday's travels took us to the Hans Herr House in Willow Street, PA. The homestead was built in the mid 1700's and has been well preserved. We were delivering soap to the giftshop, and also wanted to talk about the possibility of photographing the working walk-in fireplace for our upcoming book - By the Hearth. fragrant experience. Linden flowers have a luscious scent. My gathering basket was in the car, so I asked if it would be okay to take some of the flowers. Linden is said to have sedative properties, and is both relaxing and helpful for anxiety. Used as a tea, it is also diaphoretic, slightly raising the body temperature and encouraging perspiration. This is useful for helping hurry viruses on their way out of the body. It is used for coughs and colds, is expectorant, helpful for digestion, and good for headaches - among other things. I've been looking for linden this year and it is very commonly planted along streets in our little town and also in Lancaster. Those trees are not suitable for harvesting because of their location. This one was perfect. 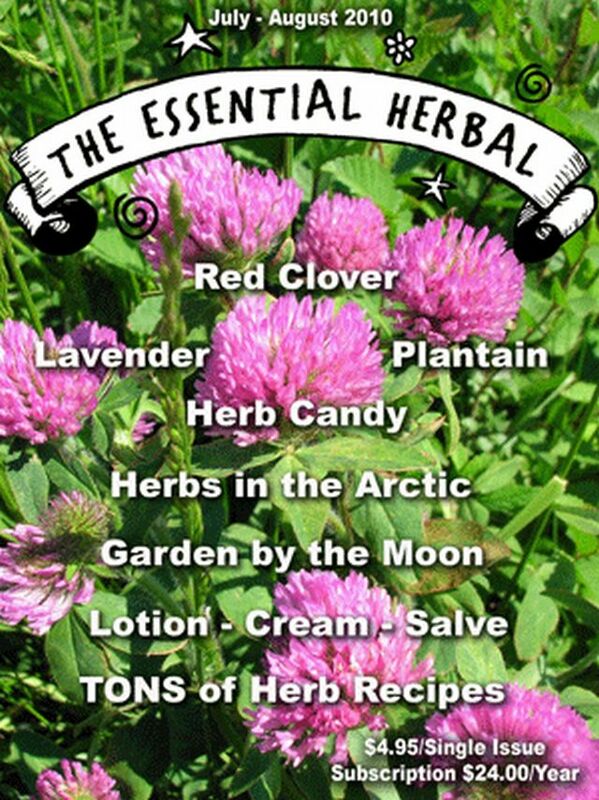 The flowers and leaves can also be used in bathing herb blends or alone. They are also used in various skin care recipes, and the scent (available typically as a synthetic) is used in all sorts of preparations and products. Life has seemed very simple lately. That's a good thing. Maybe it comes from the passage of time, and realizing that time is not a resource to be wasted. We only get so much. Life is good here on the hill. My nephew jokingly (I think...) calls me a hermit, but at this moment there is nothing more interesting than the gardens, or wandering through the fields looking at the weeds, watching the sun set or a storm roll in, or stretched out flat on my back looking at the stars. 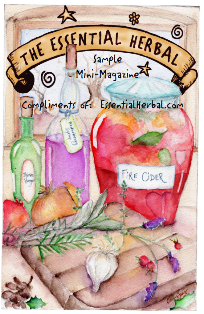 Our days are filled with making things - tinctures, infused oils, salves, soaps - writing, and watching things grow. Right now, that seems just about perfect. Next month, who knows what crazy turn I will wholeheartedly embrace? Right now, it's a fine life. Time to think, dream, care, and clear out the cobwebs. our little bayberries are growing up! It has probably been almost a decade since the first time I came across enough bayberries to harvest and "render". We were spending a few days along the shore in Delaware, and the large bushes were everywhere, heavily laden with bunches of the tiny berries hidden close to the wood. They were so fragrant, and the cup or so of berries that came home with me yielded a few ounces of wax. The process filled our home with heavenly scent for days. I was hooked. The following spring we found a large stand of bushes during a local herb festival, and talked to the groundskeeper about gathering them in the fall. From then on, we've been using it in the bayberry soap made at my sister's soap company. The following year, her husband got 25 bushes in (he doesn't do things in a small way), and they had a few berries last year. They are reaching maturity now, and this year there are many berries. We will use our own wax this fall. Bayberry is also known as Candleberry, Sweet Gale, and Wax Myrtle, among several other names. Historically the root bark is used medicinally, and is an astringent. The leaves are wonderfully aromatic and can be used in place of bay leaves. The berries mature to a deep, almost black blue, and become covered with tiny balls of wax that makes them appear white. When they are boiled, the wax releases from the berries and floats to the surface. It is extremely dense, and takes on a deep pea-green color. It is often used in candle-making, and it adds a hardness to soap that helps make it long lasting. My friend Patty was over the other day. She was showing me the note cards that she's made with some of her photos, and then we went outside so she could look at my beautiful weeds. When I saw her camera, I said, "hey... do you think my camera could do that?" She said that all digitals have "macros". Well now. You know how the Charlie Brown cartoons always portray the teacher's voice as, "waaa waaa waaa"? That's the sound I hear as soon as anyone tries to explain anything vaguely technological. Somehow she managed to get through. Patty and I go back to 7th grade, so she's been around when I learned a LOT of things I didn't want to learn. A cell phone is completely beyond me. Once I start pushing buttons, I'm lucky if it doesn't dial 911. Or the most recent wrong number (again). So for the past 5 years, I've just been taking really big pictures and cropping the snot out of them. This delphinium has been attempting to grow and blossom for 3 years now. No kidding! The resident groundhog (oh, don't get me started....) has nibbled it to the ground repeatedly each year, denying me this beauty. This year I put flexible drainpipe around it, and he didn't notice until it was too late. It was worth the wait. An ornamental sage is spreading across the front walk, but it's so pretty I don't have the heart to tear any of it out yet. However, it does seem to provide my arch nemesis the groundhog with excellent cover, so you never know. In the field, the thistles are already flowering. The patterns in the buds and base of the flowers are perfect for copying in embroidery. Even the bursting heads on the top of the wild onions are so pretty to look at. I think I might have a problem. Again.... sorry. It is Patty's fault for showing me how to do this.